Fishing World is located in the Minburi district on the outskirts of Bangkok some forty kilometres from the madness of Bangkok city centre.This daunting venue is a large body of water covering almost six hundred acres with depths going down to some twenty five metres in places containing various species of fish both native and imported to Thailand. 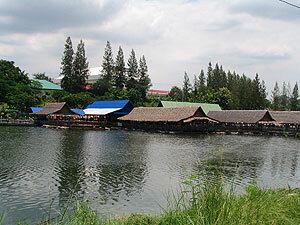 Fishing World in Bangkok is a mature lake which has received various stockings over a twenty year period. This venue was netted many years ago in some of the initial stockings of Bungsamran Lake which produced some exceptionally large Mekong Catfish and Siamese Carp. It is thought that only a small percentage of the lakes inhabitants were captured in this netting and that many large Mekong Catfish and Carp species still reside in this ‘massive inland sea’. Bottom fishing at this lake is a totally unknown quantity with lure casting being the most commonly used approach in addition to jigging and trawling methods from our onsite boat. FW is an extremely large lake which holds numerous predatory species which regularly produces big Giant Snakehead, Hampala Barb, Pacu and various other predatory species. In addition to fishing from our onsite boat, angling at this venue is also available from several stilted lodges with a few air conditioned bungalows also located near the restaurant area of the lake. 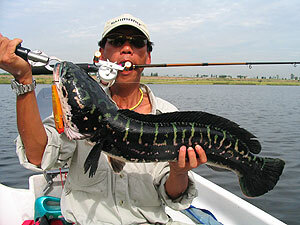 The Fishsiam team have accounted for various predatory species whilst lure angling at this venue with Giant Snakehead and other predators to 8kg/17.5lb. Please note that at the time of writing we are unable to offer packages at this venue due to the venue now being used solely for water sports.